Ushuaia/Leipzig. During the next two months, a Spanish research expedition will investigate climate change on the Antarctic Peninsula. Two researchers from the Leibniz Institute for Tropospheric Research (TROPOS) are also be participating to investigate the influence of sugar compounds on cloud formation above the ocean. In January, the research vessel R/V Hespérides from Ushuaia in Argentina have set off for the PI-ICE expedition. The expedition around the Antarctic Peninsula will be followed by laboratory experiments on the interactions between atmosphere, ice and ocean at the Spanish Antarctic station Juan Carlos I on Livingstone Island between Antarctica and the southern tip of South America until mid-March. The Spanish Antarctic expedition PI-ICE (Polar atmosphere-ice-ocean Interactions: Impact on Climate and Ecology) focuses on the effects of natural marine aerosols on climate and ecology. These tiny particles from the ocean are of great importance because they strongly influence solar radiation in the atmosphere and biogeochemical cycles. Nevertheless, there is a lack of aerosol data in the polar regions and especially in the polar sea ice zones, which are one of the largest ecosystems in the world, with a multitude of habitats and organisms living under extreme conditions. As climate change is particularly rapid in the polar regions, understanding of these biogeochemical processes at the air-ice sea interface is crucial to identify feedback mechanisms that influence climate change. The research vessel R/V Hespérides will therefore bring together experts from a wide range of disciplines. "We were very pleased to receive an invitation from expedition leader Dr. Manuel Dall'Osto from the CSIC Institute for Marine Research, as it gives us the opportunity to study the Southern Ocean as well as the Arctic Ocean. The comparison of the two polar regions could reveal interesting relationships", reports Dr. Manuela van Pinxteren from TROPOS. The atmospheric chemist is a expert in organic substances and has specialised in the interactions between the atmosphere and the ocean. Among other things, she leads the Leibniz project MarParCloud, which investigates the process from bioproduction in the ocean to organic aerosol particles and maritime clouds. The focus is on the surface film of the ocean. "This wafer-thin layer acts like a filter between the water and the air. Everything that wants to go from one world to another has to pass through there. We will collect this surface film again with a glass plate from the inflatable boat or the ice edge and freeze it so that we can later examine it in the laboratory in Leipzig for substances from the sea and the air," says van Pinxteren. Therefore, her team also takes air and water samples at the same time to decipher the path of the substances. The focus is particularly on so-called polysaccharides, i.e. multiple sugars, which are formed by plankton in seawater, are released into the air and then become particles on which water condenses or freezes to ice. This is how clouds form. The formation and reflectivity of the clouds then has consequences for the energy balance of the atmosphere and the melting of the ice, which in turn influences the plankton in the ocean. These very complex feedback processes between biosphere and climate will also be part of the MOSAiC expedition: In September 2019, the German research icebreaker Polarstern, led by the Alfred Wegener Institute (AWI), will drift through the Arctic Ocean for one year. Supplied by additional icebreakers and aircraft, a total of 600 people from 17 countries will take part in the MOSAiC expedition. Together with an international partner, the AWI is responsible for the five main research areas: physics of sea ice and snow cover, processes in the atmosphere and in the ocean, biogeochemical cycles and the ecosystem of the Arctic. TROPOS will play a leading role in two central measurements: Firstly, a remote sensing container for the entire ice drift will continuously explore the vertical aerosol and cloud distribution using lidar, radar and microwave radiometers. On the other hand, a tethered balloon will measure the Arctic boundary layer as accurately as possible during the fourth leg of the journey. Manuela van Pinxteren will also investigate the surface film on the sea and on melt pools. "In 2019/20 many nations will focus on the Arctic through the MOSAiC expedition. At the same time, climate change is also progressing in Antarctica. The Spanish Antarctic expedition is therefore important in order to better understand parallels and differences," explains Sebastian Zeppenfeld of TROPOS, who will take part in the first part of the expedition. In the second part, he will be replaced in mid-February by Manuela van Pinxteren, who plans to spend a month at the Spanish Antarctic station Juan Carlos I on Livingstone Island, where she will carry out laboratory experiments in addition to field measurements. Huang, S., Wu, Z., Poulain, L., van Pinxteren, M., Merkel, M., Assmann, D., Herrmann, H., Wiedensohler, A. (2018): Source apportionment of the organic aerosols over the Atlantic Ocean from 53° N to 53° S: Significant contributions from marine emissions and long-range transport. Atmos. Chem. Phys., 18, 18043-18062 p.
The Leibniz-Institute for Tropospheric Research (TROPOS) is member of the Leibniz Association, which connects 95 independent research institutions that range in focus from the natural, engineering and environmental sciences via economics, spatial and social sciences to the humanities. Leibniz Institutes address issues of social, economic and ecological relevance. They conduct knowledge-driven and applied basic research, maintain scientific infrastructure and provide research-based services. Samples of the surface film are taken with a glass plate during the Polarstern expedition PS106 2017 in the Arctic Ocean north of Spitsbergen. In order to rule out the influence of the icebreaker, the researchers travel to the open ocean in survival suits in a rubber dinghy. 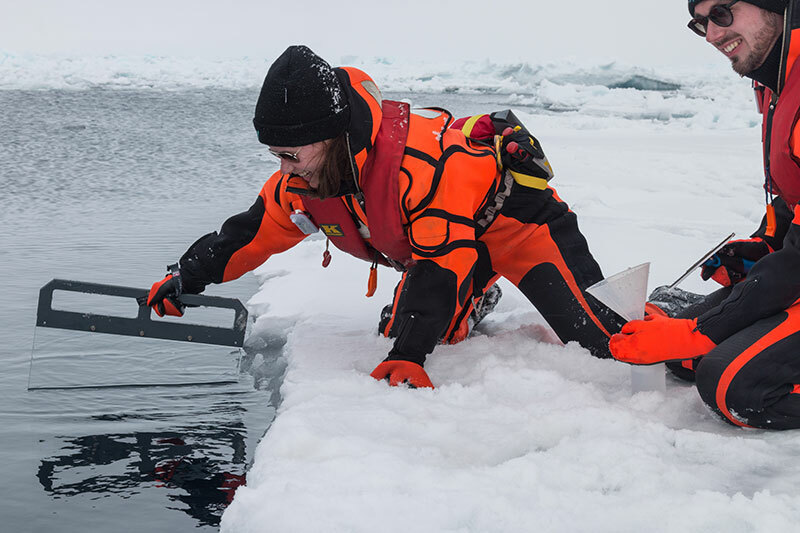 Dr. Manuela van Pinxteren and Sebastian Zeppenfeld from TROPOS sampling an ice floe during the Polarstern expedition PS106 2017 in the Arctic Ocean north of Spitsbergen. The surface film adheres to the glass pane, is then wiped off with a windscreen wiper and filled into bottles. The frozen samples will later be analysed in the laboratory in Leipzig. 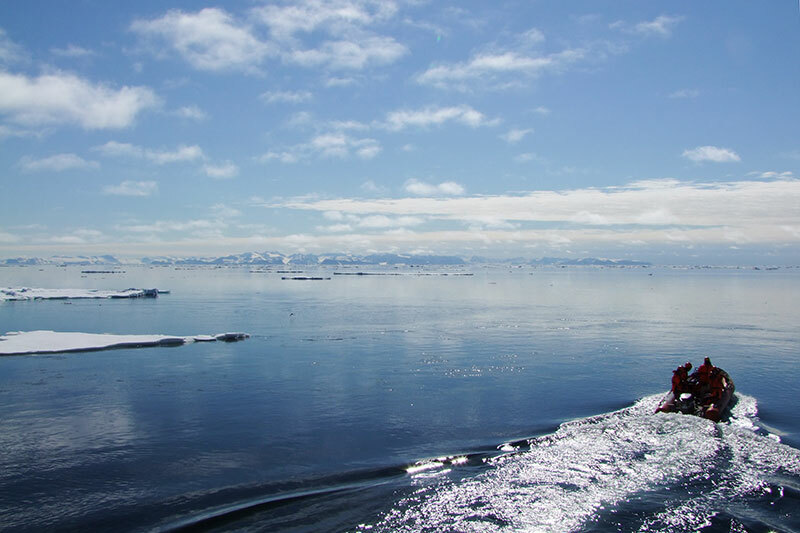 With the expeditions to Antarctica and Arctic 2019/20 the researchers want to learn more about the biogeochemical processes between ocean and atmosphere. 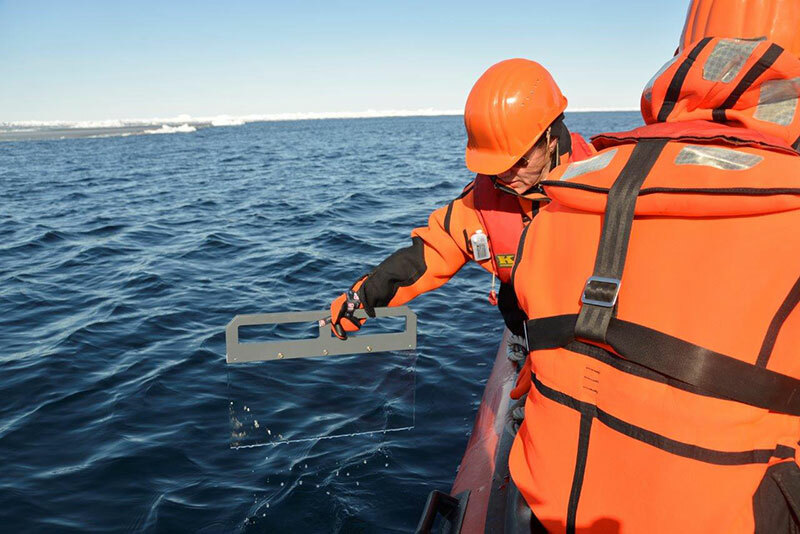 Polarstern expedition PS106 2017 in the Arctic Ocean north of Spitsbergen: In order to rule out the influence of the icebreaker, the researchers travel to the open ocean in a rubber dinghy for sampling in survival suits. Since 2016, Transregio 172 of the German Research Foundation (DFG) has been investigating "Arctic climate change" to find out why the Arctic is warming much more than the rest of the Earth.